Paula inspects a cactus tree (above), and Bill pretends to pout over yet another flat tire (below). A map of the places mentioned in the diary. The 1951 Chevy Bill and Paula drove to Mexico. Who are Bill and Paula? Bill Muster is my late father,*and Paula is my mother. My mother remembers the trip as being a fun adventure.She told me the flat tires were due to bad roads and it was easy to get them fixed.The worst things, as she remembers it, were the sunburns they received in Tampico, and the asthma (described in the diary).She said she wonders why she did not connect the asthma with all the cigarettes they were smoking.She laughed about the price of gas and cigarettes mentioned in the story: 19.5¢ a gallon; $1.60 a carton.Marg and Loran, mentioned at the beginning in Texas, above, now live in Arizona, and are still friends withmy mother and her husband, Don Hassler.My mom is a writer, and she okay'd me sharing the photos and her story on my website.These photos exist as a scrapbook; my mother wrote the diary on small notebook pages while my father was driving,and preserved them an envelope left inside the scrapbook. 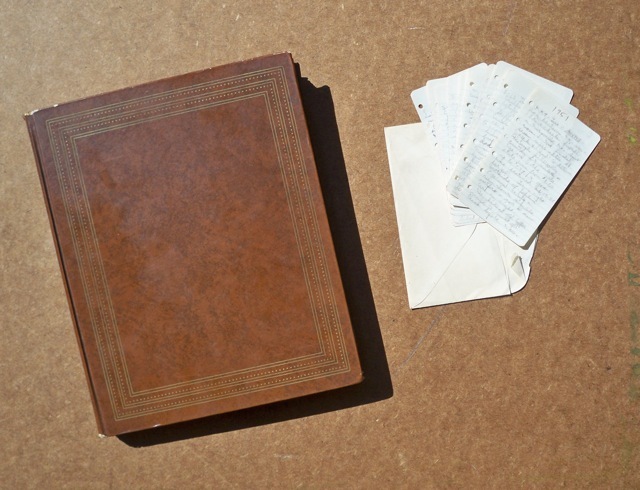 The scrapbook and journal are now part ofthe Bill Muster travel photography collection at the University of California, Santa Barbara, SpecialCollections Library. 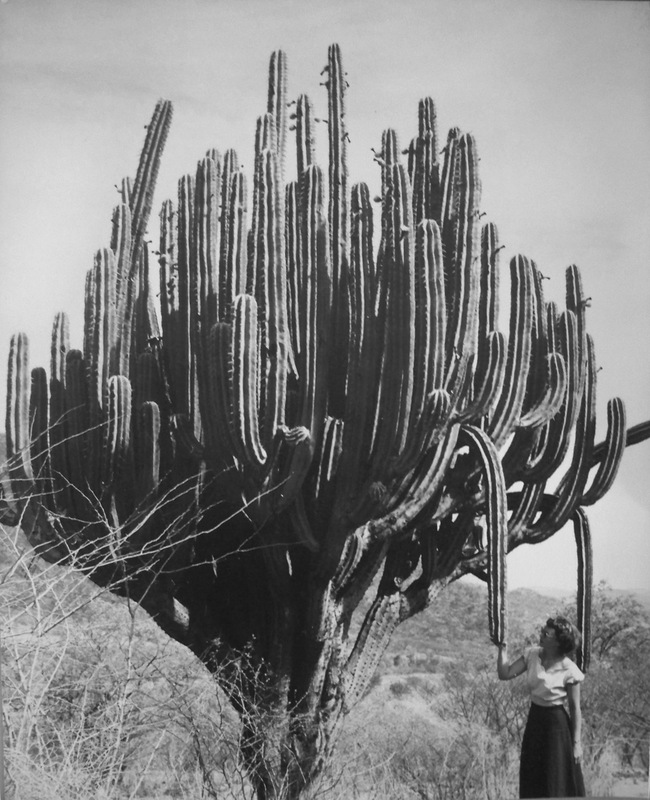 See all the 1951 Mexico photos - click here. 4-29—Tue. Started from Denison 7:30 am.—front wheels fixed in Maryville, Mo. about noon. Hit flooded area right after St. Joseph & had to detour through hillbilly country for miles—cigs in the mule state run from $1.60 up to $1.79 [a carton] & gas was featured at 19.5¢ per gal. Town right outside of Joplin (Galena) really a run-down miserable outfit, not a new car in sight. We killed off coffee, milk & most of chick before 5:00.Practiced Spanish in car a bit in a.m. Gas in Oka. higher than MO—26.5 a gal. Cigs? [did not buy any] Pulled into one "Berg's" auto court at Muskogee Okla.—asleep at about 10:00—hot showers too. 4-30—Wed. Up & on road before 7:00—Lovely Oakie music on radio—wors'n the cornballs in Ia. Discovered omission of my raincoat—groan—got to Dallas on sched. at noon. Stopped at UPee [Post Office] & had lunch with Chuck McCathy. Got to San Antonio about 9:00, called Marg & Loran Baxter & had coffee with them. Bed late. 5-1—Thur. Met Loran for breakfast, saw Randolph Field and Ft. Sam, Houston [where Loran was stationed]—Then back to trailer, then downtown to Alamo & all pretty houses. Took pix. Had dinner booze & talk at Officer's Club. Shrimps didn't like Bill too well. Stayed at Baxters' all nite. 5-2 Fri. Took off 8:00—Reached border & crossed by 1:00 pm. Not much trouble. 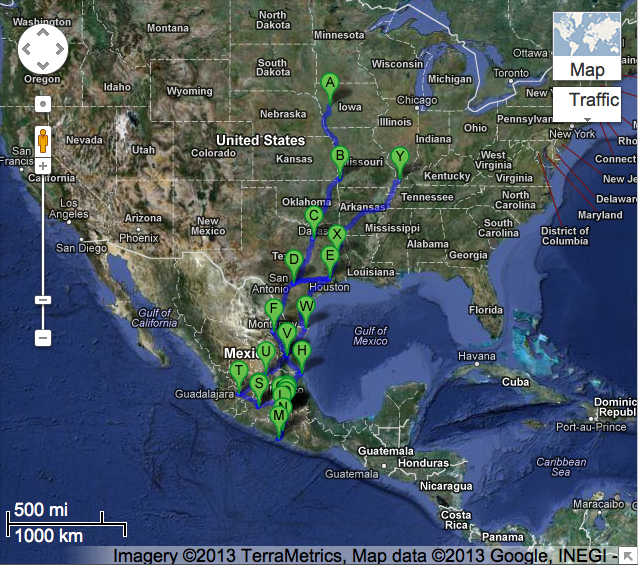 Reached Monterrey about 5:00 & drove around town. Found nice motel Royal Courts, showered & fell in sack at 7:30 & slept til morning. 5-3—Sat—got up at 8:00—Drove downtown & ate desayuno. Walked around market places & the town. Bill bought a nice belt. I've had a funny rash on my arms—still there. We've been drinking water, milk, fruits, vegs, everything they told us not to. No ill effects so far. Walked around taking a few pix—had roast cabrito & carta blanca. Went back downtown—got Bill a guayabera. Had dinner at Sanbourns—all Mex dishes. Went to Copacabana after a ride in a horse drawn cab. Drinks expensive & music blaring but we had a good time nightclubbing. One guy, "el borracho," was more fun than the show. 5-4 Sun. Took off early for Tampico—stopped in Cuidad Victoria for lunch, visited the markets (which were going strong on Sunday) bought a canasta. Met a 17-yr-old boy in the park, got to talking & gave him a ride to Tampico. We talked Spanish practically all the trip. He was a nice little guy—Salvatore Rodriguez—We found nice modern motel "Colorado Courts" for 25 pesos a day. Had asthma all night. 5-5—Monday—Woke up with car battery dead. Took it to Chev. garage & got it charged up—I went to a doctors & got some pills, medicine & stuff, for shots for asthma ¡Vieja! We went to El Sol & shopping a while—didn't buy anything. Took siesta & then went to the beach—met a nice young couple from Big Spring, Tex—Betty & Bernie Rains. Also a blabbery traveling salesman from Tex—Jerry—got cleaned up after the beach, visited El Sol again briefly—no one there. Had dinner with our 3 friends at El Colon & went walking in the square—big Cinco de Mayo celebration. Talked with Polish & French sailors in park—very interesting. More asthma tonight—medicine didn't help no how. 5-6—Tue. Up early and raunchy—had breakfast at the kids' place & then to the beach about 11:00—Wonderful swimming & swell beach. We showered at Raines' place & had dinner & played bridge til we all got sick from the afternoon's sun. I got a flutter in the heart too. Got some vinegar & dragged home. No asthma tonight—I didn't use the pillow. That must've been it.—Toward morning I started to use the pillow & got it again. 5-7—Wed—up at 8:30 for a date with the vinegar bottle—oh, such sunburns!! Took off for Mexico [City] about noon. Beautiful mountains & road but rather hard driving. Had dinner at hotel in Jacala—pretty lousy & at 12 pesos each. We reached Zimapam about an hour after dark & stayed at Hotel Fundación—spooky old place—very interesting. Met a nice couple in the bar—he from Oklahoma, she from Andalucia Spain—bed early. 5-8—Up at 7:00 & on way to Mexico after eating & talking pix of Hotel Fundación. We hit Mexico about noon—Wow!! How they drive in this city. We found Shirley Courts & got a nice room. Had some lousy hamburgers & sodas. Went downtown & saw all the stores & hotels. Went up to UPee too. It gets cold in the evenings so I got a bolsa—white. I like it muchley. We're going to take cabs wherever we go—Wow what traffic. 5-12—Mon—Left Cuernavaca about 8:00—got to Taxco about 11:00 am—Bought a chartreuse blouse there—Real quaint town but very tourist conscious—very high prices on everything—Pretty drive thru mountains—bad roads however. Arrived at Acapulco at 8:00—got room at Hotel La Playa—fancy joint—went swimming right away—really hot here—nice beach—Looked over the town. 5-13—Tue—Went swimming before breakfast—We're both peeling like mad from Tampico sunburn. Swam & laid around on the beach & went for a ride in glass bottom boat—Went to town & got 2 sports shirts for Bill & one for dad. Leather shoes, & big skirt for me. Also huaraches for Bill. Drove around town some more & had dinner downtown. Took lotsa pix—Went to bed early. Real nice birthday. 5-14—Wed. got up early & went fishing for three hrs at 7:30-10:30—Had lots of fun & got 8 big fishes. Swam rest of am & in pm. drank some Tecate beer. Took showers & checked out about 3:00—Had lunch at de la Playa. Such monstrous lunches they serve—about 5 different courses. We got to Chilpancingo about 7:00—had snack (flan con helados) at El Rincón & crapped out real early. 5-15—Thurs—Left Chilpancingo after eating breakfast at El Pinion—Stopped off at Cuernavaca at about 12:30—Looked around the Mercado. Didn't buy anything but Puros for dad—arrived Mexico about 3:00—raining. Went shopping got another purse for Pete's wife, silver serving spoon & fork for Stone, & ashtray for Ed. Went to UPee several times & got pkg to mail for Paul. Got room at Hotel Regis—very nice room—35 pesos. Took nice bath—bed early. 5-16—Friday—Had breakfast at Regis—Bill got a haircut—Ha! Cashed a $100 check at the bank, went to UPee again & left Mexico about noon. Had a good rain & a nice drive to Toluca—Had swell 5-course lunch for 5 pesos each & bought a pink rebolsa & a big Canasta—Left Toluca about 4:00. Drove thru mountains in dark—had a helper driving ahead of us. Reached Posado del Don Vasco en Patzcuaro—Saw Paul & Ann—Bed pretty early. 5-17—Saturday—had breakfast with Paul & Ann & we all took a boat trip out to an island in Lake Patzcuaro. Island is Janitzio—big statue of Morelia on it. We looked around Patzcuaro & bought a hand lacquered tray & a pair of masks for our wall. A little boy guided us. Arrived in Guadalajara about 8:00. Real modern city—walked around & shopped—got some silver earrings. We had filets at a real fancy restaurant. La Copa de Leche—got room at Morelia Hotel. Washed hair. 5-18—Sunday—Had breakfast at hotel—most stores closed—Sunday—but we got some things in the subways - & big knife for Pete & a little one for Bob—purse for Vicki—checked out & found a big mercado roaring away—got cup & saucer, ash trays & a set of dolly dishes—all from Telapaque—Drove to San Luis Potosi—had flat tire on the way. Ruiz Cortines was in town—finally found a hotel room at the Colonial—Watched the fireworks & celebration. Bill got hit by a Roman candle. 5-20 Tue. Hit road at 6:00—no breakfast. Ate in a crummy joint on the road. Real horrible road. We had another flat—some people from Florida stopped & loaned us their jack. Hit border about noon & got thru customs without any fuss. We had to pay $2.66 on the booze. 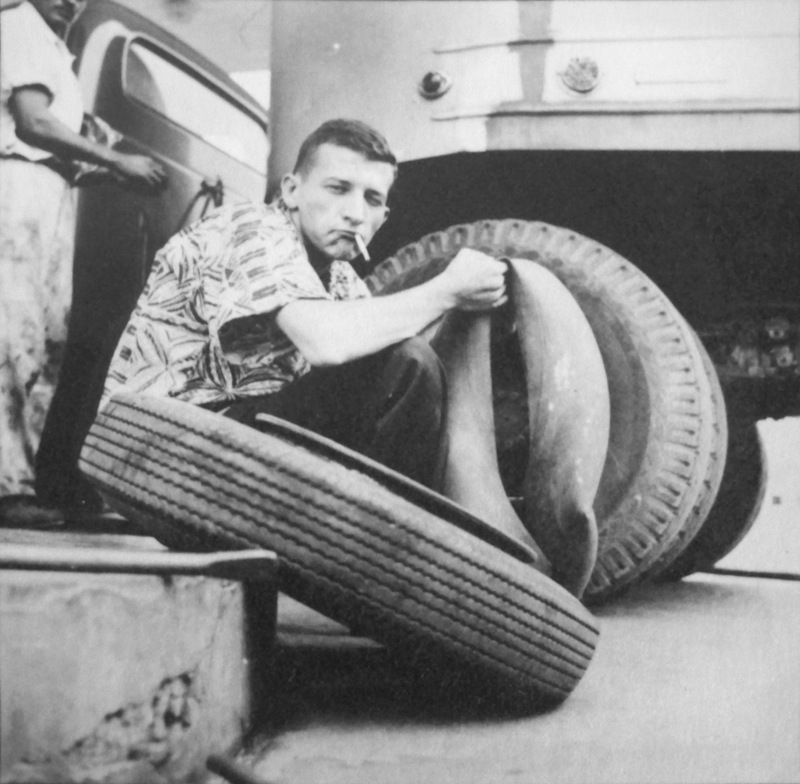 Stopped in Brownsville & bought a new tire. They gave us an adjustment on the one that went bad. Drove all day till about midnight. Stayed at a motel in Lufkin, Tex. 675 miles today. Washed hair. Asthma. 5-21 Wed. Up early—had breakfast & on our way. I had asthma pretty bad so we stopped somewhere in Arkansas & saw a dr. gas is 30¢ in Arkansas. Wow—Had lunch at a place called "Hanks" near Little Rock. Got to Cairo, Ill. & stayed at a motel. One summer my husband and I decided to take a driving vacation from our home in Minneapolis to Acapulco, Mexico. It was an ambitious trip, but we newlyweds had two weeks off from work and we were young and adventuresome. 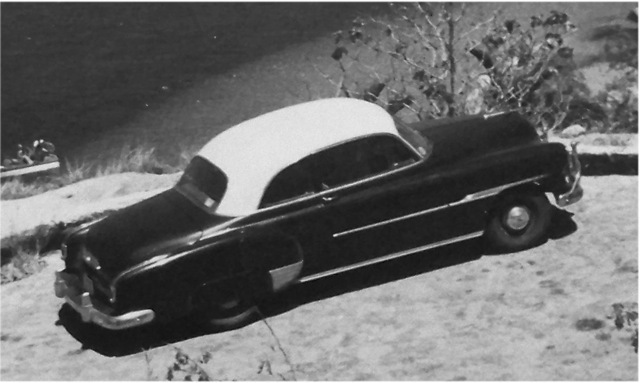 Our brand-new 1951 Chevy sports coupe was in good shape, but on a remote mountain road north of Acapulco the right rear tire blew out. We managed to pull off into a wooded area, and my husband started to work on changing the tire. While trying to raise up the car, he cried out, "Oh no! The jack is broken. It doesn't work!" It was then that we noticed several men had appeared from out of the woods and stood watching us silently. Soon a few more fellows materialized, and dusk was approaching. I was trying to remember my college Spanish because the men, now about a dozen strong, had more or less surrounded us. Finally, I opened my mouth, and out came, El levador esta roto y no sirve (The lifter is broken and it doesn't work). Aha! Suddenly our audience came to life. Laughing and chattering among themselves, they found a large log and rolled it close to the rear of our car. Several of them grabbed the bumper and lifted the car so the others could put the log in place. They helped my husband get out our spare, helped change the tire, and then removed the log. Now we were ready to be on our way again. With many a muchas gracias, we broke out our bottle of souvenir rum and passed it around, each man swigging a good gulp. We did the same. Our newly found friends waved goodbye and (if my Spanish served me) called out their wishes that God be with us on our adventure.